Who says gold, silver, graphite, and bronze don’t go together? This gorgeous, entirely salvaged Votan necklace by DLC Brooklyn (neé Dirty Librarian Chains) breaks all the old-school fashion rules to stunning effect. We’d pair the 21-inch long bauble with neutral tones so that it stands out in all of its antique glory. Word to the wise: Only 17 pieces are available, so move fast if you want to snag one for yourself. 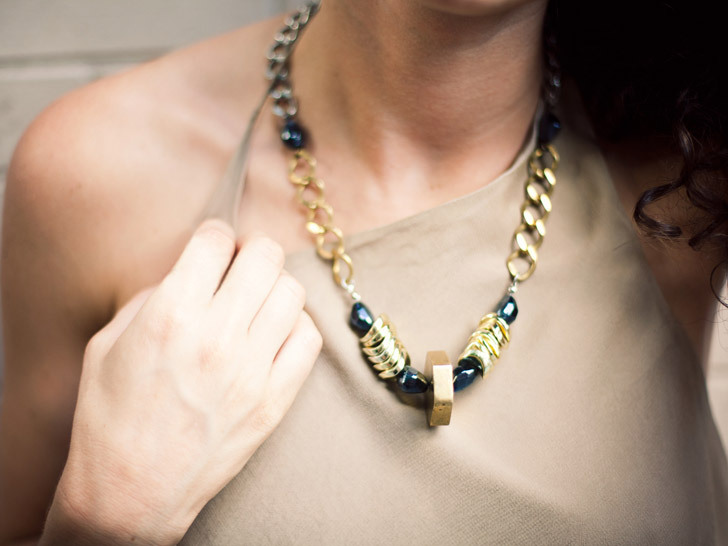 Score DLC Brooklyn�s Upcycled Necklace at Of a Kind�Only 17 Made! Who says gold, silver, graphite, and bronze don�t go together? This gorgeous, entirely salvaged Votan necklace by DLC Brooklyn (ne� Dirty Librarian Chains) breaks all the old-school fashion rules to stunning effect.�We'd pair the 21-inch long bauble with neutral tones so that it stands out in all of its antique glory. Word to the wise: Only 17 pieces are available, so move fast if you want to snag one for yourself.